The days of the old Jarl were long and prosperous, but soon Lord Odin would come to see his demise, and with it, the rise of a new Jarl. And as he passes on heirless, a path to greatness opens before each of you. Build your own village, gather your men, recruit famous Vikings, and take to your longships - to sail the seas of the known world. You are all skillful sailors, shrewd traders and fearsome warriors – but only one of you will sail the farthest, become the chosen of the Allfather, and only one of you will sit on the Jarl’s throne to rule in the name of Odin! In the Name of Odin is a strategic game for 2-5 Viking warriors. 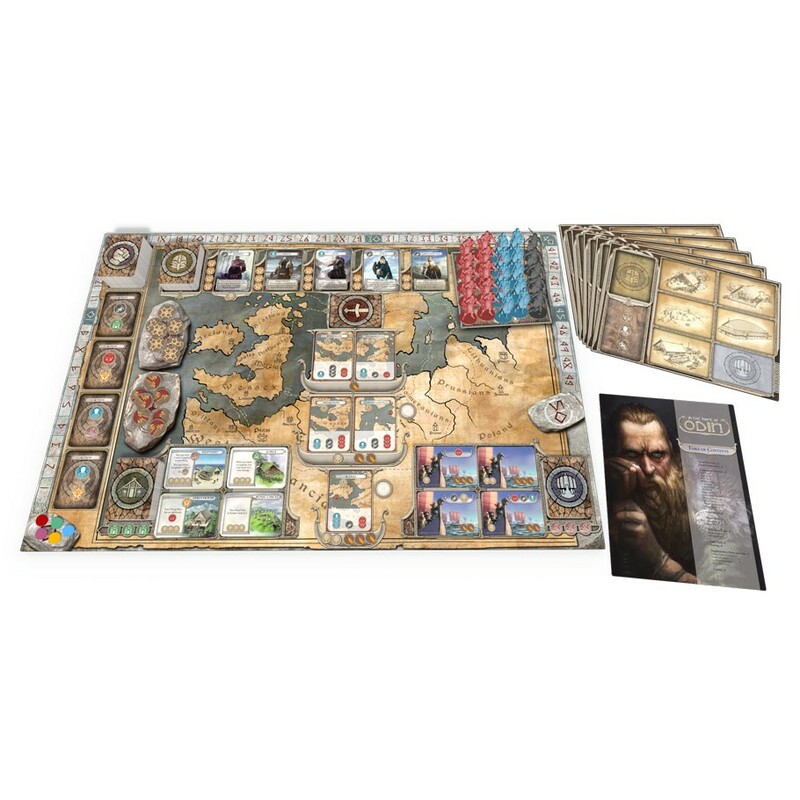 On their turn, players use Action Cards to construct new structures in their villages, gather their men, recruit famous Vikings, and buy longships – all to go on raids. Each raid comes with its own set of requirements, and a prize in Fame . At Game End, whoever has gathered the most Fame will become the new Jarl, the chosen of Odin – and the winner of the game. As ambitious Northmen you are trying to prove yourself as cunning leaders and bold raiders to gain the most Fame before the game’s inevitable end. To do that you will go on Raids. 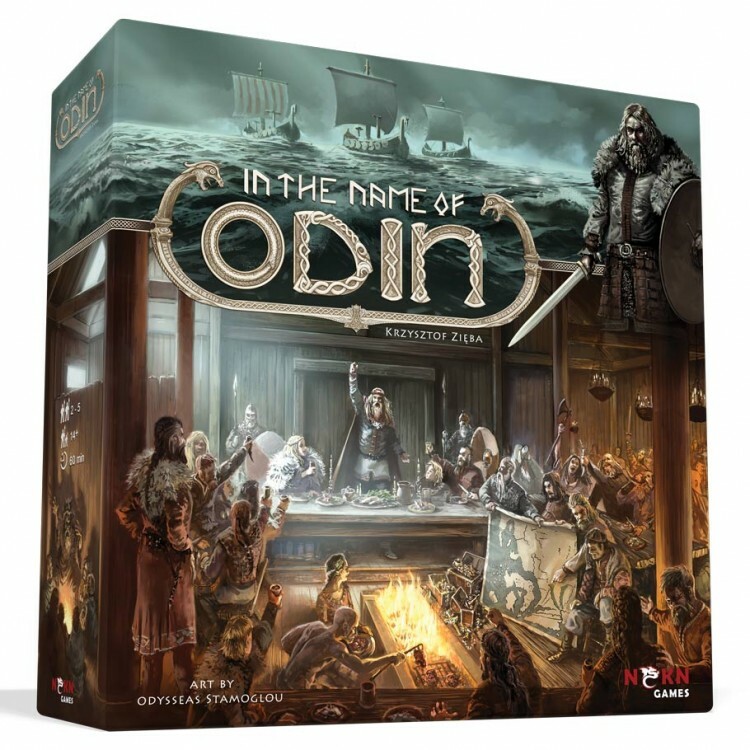 Each Raid is a card that (depending on its position on the board) requires a longship of certain range to reach, a combination of three types of Vikings under your banner, and a famous persona to lead the expedition. It means you will have to gather or build all these elements and turn them in to claim the Raid card and score its Fame value.